The Life Of Faith: How I told my husband "I'm pregnant!" I still like saying those two little words that have such big life-changing meaning behind them...literally life changing already! Well, it just so happens that I really did not think that I was pregnant. We weren't trying to have a baby yet, so even when I was 5 days late, I dismissed it as nothing. Sure, I felt a little over tired...and things hurt that shouldn't be hurting, but I still really didn't think I was pregnant! Fortunately for me, I have a lovely friend, who is also the pastor's wife at our church, and she knows me pretty well...better than I do in this case! When she saw me at church on Wednesday night, she told me to take a pregnancy test because she thought I was pregnant. But the next morning at 6AM I decided, eh why not just pee on the stick and see! I grabbed the dollar store test from my medicine cabinet and nonchalantly went through that whole wonderful peeing-on-a-stick routine! I set the test on our bathroom sink and figured it would be a while before anything happened anyways. I was wrong. Before I could even take my next breath...two pink lines began to emerge. TWO PINK LINES! Everyone knows what that means! I wanted to freak out, start screaming and jumping up and down, but my unsuspecting hubby was sound asleep in the next room. I wanted so badly to wake him up...but if there's one thing you should know about my husband, it's that he doesn't wake up very easily. In fact, he often doesn't remember being woken up! Since I didn't want to tell him while he was half asleep, I settled for a mini dance in front of the mirror as I muffle screamed "I'm pregnant"! I went ahead to work with the biggest secret I've ever had to keep! 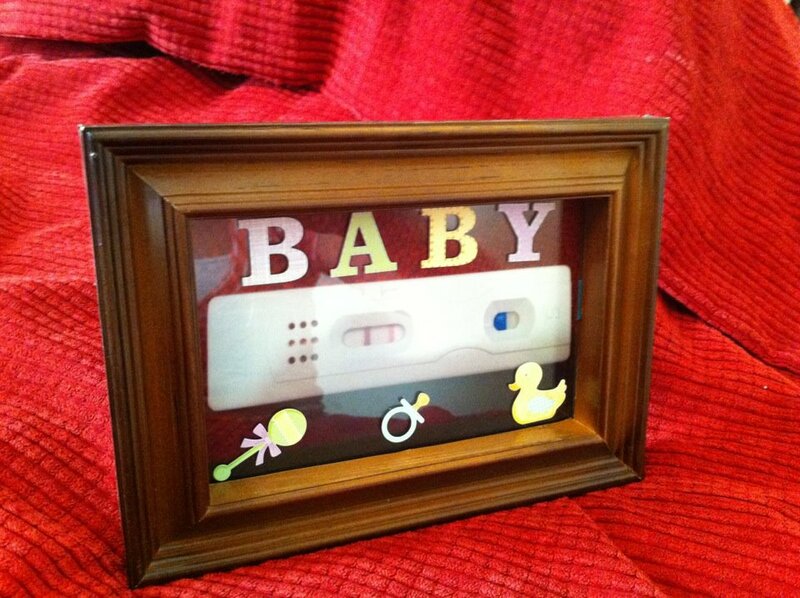 I decided to tell him by printing off a picture of my pregnancy test and framing it with baby stickers. 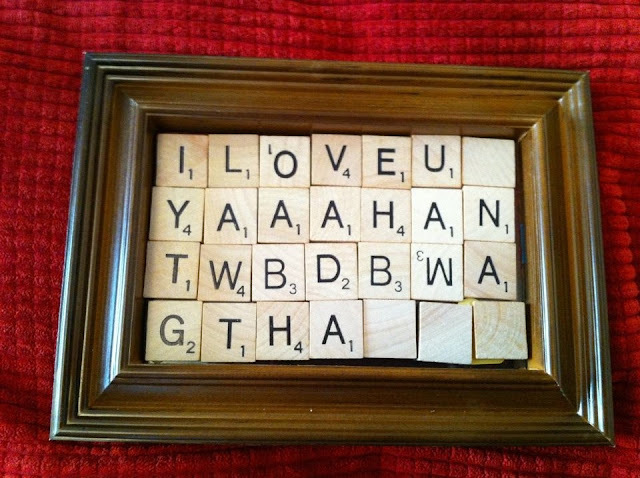 The twist was, I covered the test with acronym scrabble letters. For those of you who read our proposal story, you know that Jimmy proposed to me in an acronym, so this was only fitting. I had this sitting on the bed when he came home from work! Poor guy, he didn't stand a chance in figuring this one out. and then when he dumped the letters off of the frame...voila! I laugh out loud every time I think about the expression on his face! He was excited, shocked, scared, happy, and overwhelmed all in one expression. It was priceless. We hugged each other and then just sat there as Jimmy let it all sink in. He immediately began to talk about mini vans, strollers and buying a house haha. But we have plenty of time for that! Right? How did you tell your husband you were pregnant? I'd love to hear your story as well! OH M:Y GOSH!!!!!! 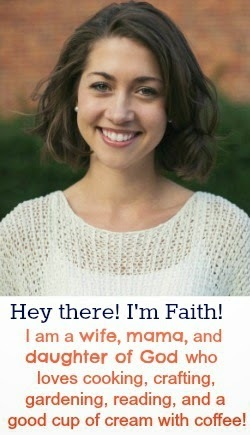 faith! this is so so so so so exciting!!!! So cute! I love stories like this! For our first (I am now pregnant with #4!) we were on a trip to Hot Springs. We were on top of a mountain and I handed him a bag of diapers and a card that said something about being a dad. It was SO fun! For #4, I found out on Easter. I put the pregnancy test inside an Easter egg and made a very impromptu Easter basket for him. Some eggs had candy, and I told him to open the biggest egg last. Oh my goodness the look on his face! It was priceless! Congrats and hope you have a great pregnancy! Aww, super cute announcement! I've always been too excited and nervous to plan any cute pregnancy announcements, lol. So cute! I love it! I couldn't surprise my husband because he knew I was taking the test, so I just had to show him the postive test...pretty boring! :) Might have to try something like this next time around. I am sooooo late on this post, but I'm also a new follower (that balances it out right????) This was so cute! many thanks amy , with this valuable piece of information.